Every morning when I wake up, I grab my phone off the bedside table and immediately scroll through our Nation's most important news source: Facebook. I'm a little embarrassed to admit it, but that's pretty much how I start every day. I consider it a quick debriefing on how everything is going in my friends' lives. This morning, as I was scrolling through the morning feed, I saw one of those annoying ads in the midst of puppy photos and political rantings. 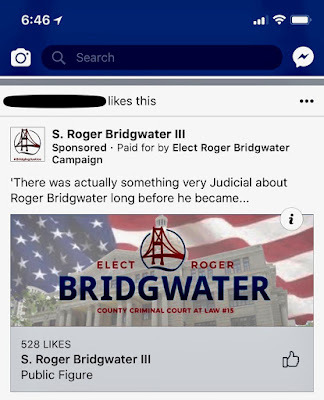 It was an ad for Roger Bridgwater's candidacy for Harris County Court at Law # 15. I was drawn to the partial quote that appeared above the logo. "There was actually something very Judicial about Roger Bridgwater long before he became . . . "
Something sounded familiar about that quote -- especially the unnecessary use of the word "actually." Oh yeah. That quote came from me. I did some quick research and sure enough, I had paid Roger that compliment back in October of 2008 when he was running for re-election against then-candidate-later-Judge David Mendoza for the 178th. I'm not one to deny words that I've said in the past, but I was pretty taken aback to see old Roger using a ten-year-old quote from me as an implied current endorsement. Anyone who has read this blog with any regularity over the past ten years knows that I'm not a fan of his any longer. Although I said those words about him back then, my opinions of Bridgwater evolved as I watched him in action after he lost the bench. By 2009, after his highly publicized attack on senior Bureau Chief Donna Goode, I wrote "the Roger Bridgwater I used to know ain't there anymore." For a quick refresher on that incident, Roger bristled at Donna questioning his decision to revoke an invitation to speak for Rusty Hardin, and he subsequently had her investigated by the Disciplinary Committee for "insubordination." He then had her locked out of her office computer, which ultimately led to her resigning from the Office. 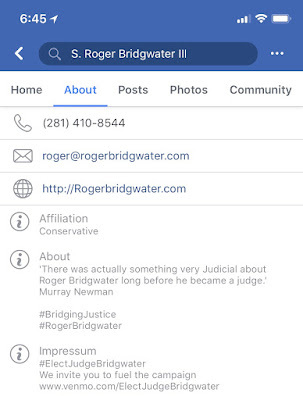 Then there was the time that Roger gave advice to a friend of his who was on a capital murder jury panel, which led to the whole trial having to be started over. That's when I realized that not only was Roger kind of a power-hungry narcissist, he was also kind of dumb. Oh, and although I never blogged about it, I heard from a potential client one time that Roger was a family friend and he had counseled them against hiring me. So, it should be no small wonder that in the multitude of times that Roger has attempted to be elected to a bench, I've supported his opponent -- in both the primary and the general election. As a side note, I went on to become a tremendous fan of Judge David Mendoza, although I had not known him prior to his taking the bench in 2009. He was a great judge and a great man. I think that we've all stated opinions that later changed due to subsequent events, and this is certainly not the first time this has happened to me. The phrases "playing high school football in the summer in Texas sounds fun," "I don't like the taste of beer," and "I do" come to mind. But Roger utilizing something that I said in 2008 on his 2018 campaign website is misleading and dishonest. He knows damn good and well that I don't support him or his candidacy, and he's deliberately misleading people to believe otherwise. 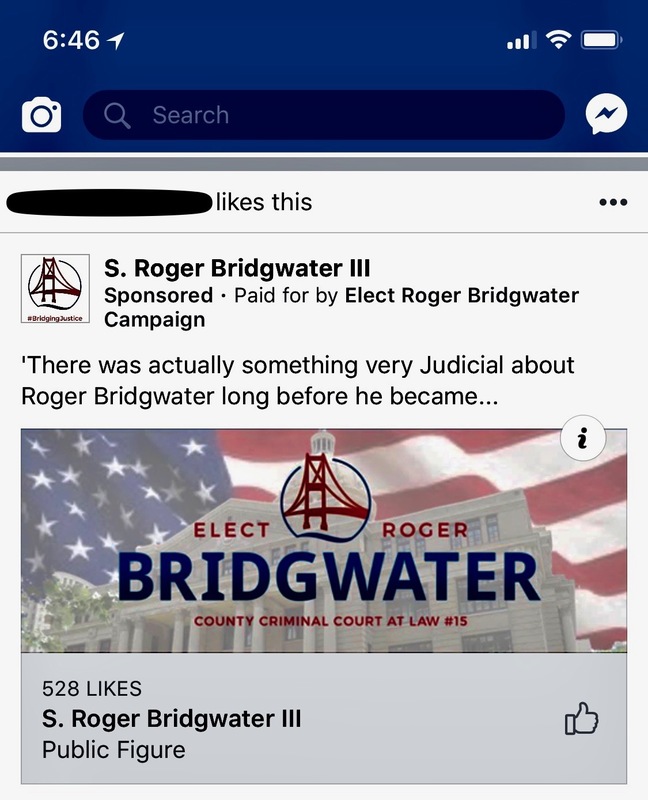 The Catch-22 of the situation is that if you know me well enough to think that who I endorse actually matters, then you probably know me well enough to know that I would never support Roger Bridgwater for Judge. 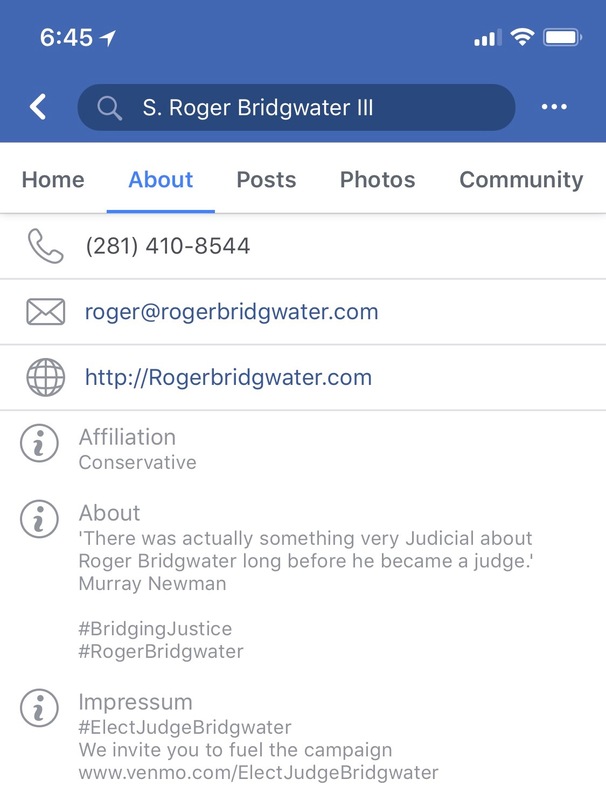 So, in case there is any questions about my feelings in the 2018 election, let me be clear: I don't think Roger Bridgwater would make a good judge. His actions since 2008 have led me to believe he is arrogant, dishonest, and not that bright. Otherwise, he wouldn't be listing me as an endorser. I'm voting for Tonya Jones in the race for County Court at Law # 15. And I approve that message. Do we know who the Hoopers are supporting in this race? Oh, wait a minute, nobody cares about that either.